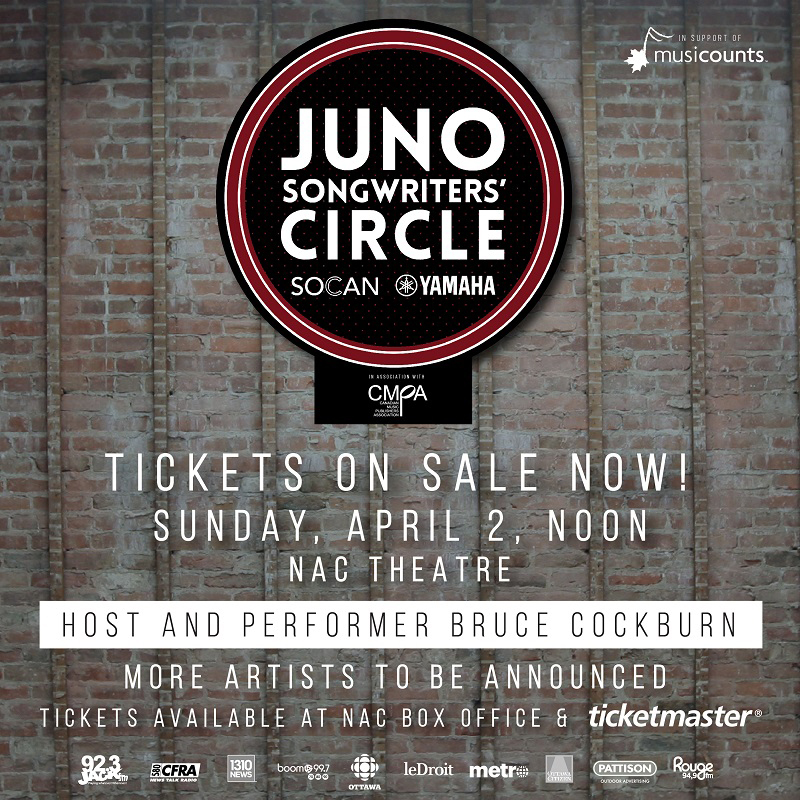 March 24, 2017 – The JUNO Songwriters’ Circle has been moved to Southam Hall and there are tickets available. Ticketmaster. Tickets to ‘Jewel of JUNO Week’ benefiting MusiCounts are ON SALE NOW! TORONTO, ON – The Canadian Academy of Recording Arts and Sciences (CARAS) announced today that Ottawa native, 12-time JUNO Award winner, Canadian Music Hall of Fame inductee, and music legend Bruce Cockburn will host and perform at the 2017 JUNO Songwriters’ Circle, to be held in the NAC Theatre at the National Arts Centre on Sunday, April 2, 2017 from 12pm to 2pm EST. Update March 13, 2017 – The rest of the lineup for the Juno Songwriters’ Circle has been announced. The Songwriters’ Circle has been moved to Southham Hall and you can buy tickets at – Ticketmaster. You can hear the concert on CBC radio in the coming weeks. The first set will be broadcast at 2 p.m. April 7 on CBC Radio 1 and 7 p.m. April 10 on CBC Radio 2. The second set airs at 2 p.m. April 14 on Radio 1 and at 7 p.m. April 17 on Radio 2.
Credit: OttawaCitizen.com – Lynn Saxberg@postmedia.com. JUNO Songwriters’ Circle is an intimate and interactive concert benefiting MusiCounts, Canada’s music education charity associated with CARAS that works to keep music alive in schools and communities across Canada. Co-presented by SOCAN (The Society of Composers, Authors and Music Publishers) and Yamaha Canada Music, in association with the Canadian Music Publishers Association, this event is considered the “Jewel of JUNO Week,” and will feature some of Canada’s most talented songwriters, performing their songs and sharing the stories behind them. Tickets to the 2017 JUNO Songwriters’ Circle go on sale on November 24 at 10am EST at www.ticketmaster.ca, the National Art Center Box Office or by phone at 1-888-991-2787. Tickets are available for $49.50 and $59.50 (plus taxes and service fees), with proceeds supporting MusiCounts. JUNO Songwriters’ Circle will be available for streaming through CBCMusic.ca and will also be broadcast on CBC Radio One and CBC Radio 2. Dates to be announced in the new year. The 2017 JUNO Award nominees joining Cockburn on stage will be announced in February 2017. JUNO Week 2017 will be hosted in Ottawa from March 27 through April 2, 2017. Premier partners of the 2017 JUNO Awards: CARAS acknowledges the financial support of FACTOR, the Government of Canada and of Canada’s Private Radio Broadcasters, Radio Starmaker Fund, Ottawa 2017, the Province of Ontario, the Ontario Media Development Corporation, Tourism Ottawa, Google Play Music and TD Bank Group. One of Canada’s finest artists, Ottawa-born Bruce Cockburn has enjoyed a 40 year long illustrious music career, releasing 31 albums to date. 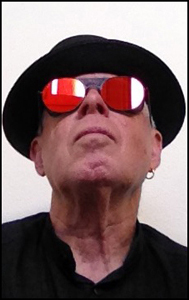 His remarkable journey has seen him embrace folk, jazz, rock, and worldbeat styles while traveling to such far-flung places as Guatemala, Mali, Mozambique and Nepal, and writing memorable songs about his ever-expanding world of wonders. For his songs of romance, protest, and spiritual discovery, Cockburn has been honoured with 12 JUNO Awards, an induction into the Canadian Music Hall of Fame, a Governor General’s Performing Arts Award, and has been made an Officer of the Order of Canada. His guitar playing, both acoustic and electric, has placed him in the company of the world’s top instrumentalists. He remains respected for his activism on issues from native rights and land mines to the environment and Third World debt, working for organizations such as Oxfam, Amnesty International, Doctors Without Borders and Friends of the Earth. Established in 1969, Yamaha Canada Music Ltd. offers a full line of musical instruments and audio/visual products to the Canadian market. Yamaha Canada Music is a wholly owned subsidiary of Yamaha Corporation, Japan, whose products and services are recognized the world over for superior quality in acoustics, design, technology, and craftsmanship. MusiCounts, Canada’s music education charity associated with The Canadian Academy of Recording Arts and Sciences (CARAS) and The JUNO Awards is helping to keep music alive by putting musical instruments into the hands of children that need them most. MusiCounts’ mission is to ensure that children and youth in Canada, regardless of socio-economic circumstances or background, have access to music programs through their schools and communities. MusiCounts achieves its mission through the Band Aid Program, the MusiCounts TD Community Music Program, the MusiCounts Teacher of the Year Award, Scholarships and other music education initiatives.